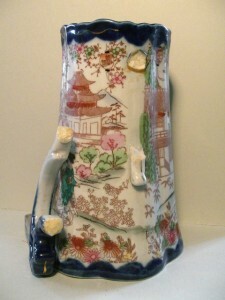 The handle was broken off this Japanese ceramic jug. A previous repair shows as dark brown adhesive around where the handle would go. 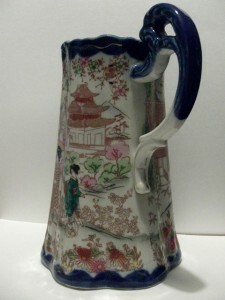 This previous repair had failed and the handle had broken off the jug again. The previous adhesive had to be removed before the handle could be reattached with a conservation grade adhesive.